It was not your usual church service at Munster United Church on Sunday, 6 March 2016. We had been walking with Jesus on our Lenten journey for the last few weeks and it was time for a brief rest – one on the lighter side. We had been advised for a few weeks that this Sunday would involve humour of the holy type and the focus would be in part on hockey. 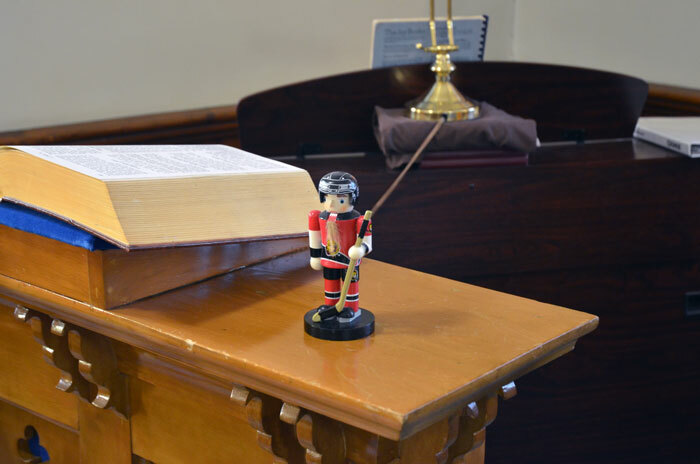 We were invited to bring hockey team jerseys to wear and hockey memorabilia and other hockey items with which to decorate the church. People responded. The choir arranged to each have a jersey to wear during the service. 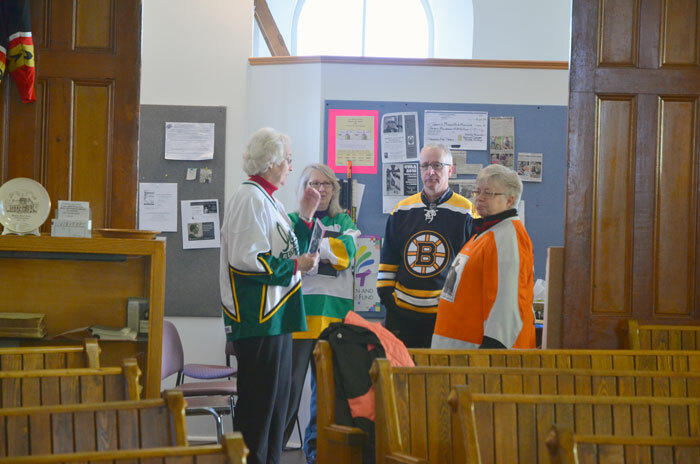 Most of the people sitting in the pews brought and wore their favourite team jersey and several brought additional hockey items and placed them on display around the sanctuary and in the fellowship area at the back. However, the choir went much further with planning to help make the service an exciting time while adhering to the theme. Keith went on-line , found a version of Stompin’ Tom Connors favourite ‘The Hockey Song” and bought and downloaded copies for the choir. In addition Keith purchased the Hockey Theme used on television for years, with which everyone is familar. The choir was very careful to keep their ‘anthem’ a secret until they sang it during the service. They choir only rehearsed it when no one else was around. They wanted it to be a true surprise because it would be so different from their typical anthem. They were certain some people would be wondering what anthem the choir could sing that would fit in with the day’s theme. If that wasn’t enough, Pat Lindsey proposed we treat the choir as a hockey team and introduce them individually at the start of the service. Rev. Karen thought this would be a great addition and would add to the fun of the morning. Keith Lindsey wrote a ‘script’ to introduce the choir members and after the loaner hockey jerseys were arranged and assigned at the Thursday choir rehearsal, finished the script details (team name, jersey number, nickname, etc.). Sunday morning the choir arrived and practiced their ‘anthem’ once – before anyone else showed up. 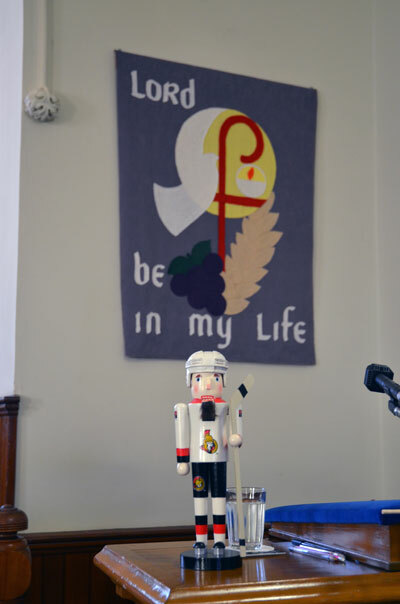 Then they decorated the sanctuary and fellowship area with the hockey items they brought. As non-choir members arrived, they donned their jerseys (if not already wearing them) and displayed their items. The sanctuary was quite the sight. – Keith “Deck the Halls” Lindsey playing left bass. – psychiatrist to the players. During the service Rev. 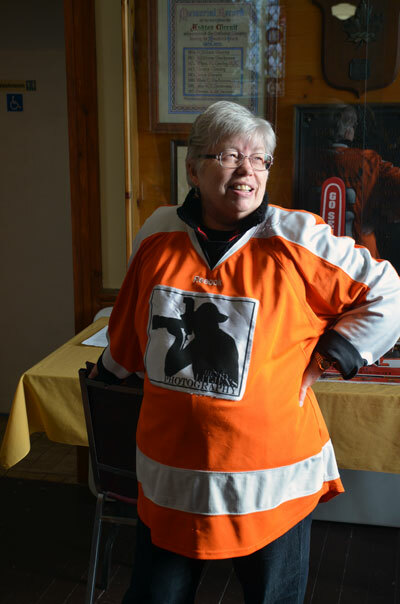 Karen made references to hockey, players, and the game in relation to scripture, introducing the latest disciples we were looking at, her message, and prayers. It was an interesting time and the references helped convey her messages and thoughts as well as connecting well with people in the sanctuary. The people sitting in the pews enjoyed the choir anthem and some were observed singing along through the whole song. Overall the service was a success and a refreshing stop along our journey. On Sunday, 20 March we will be obtaining a more intimate look at the disciples, once they have all been introduced to us. 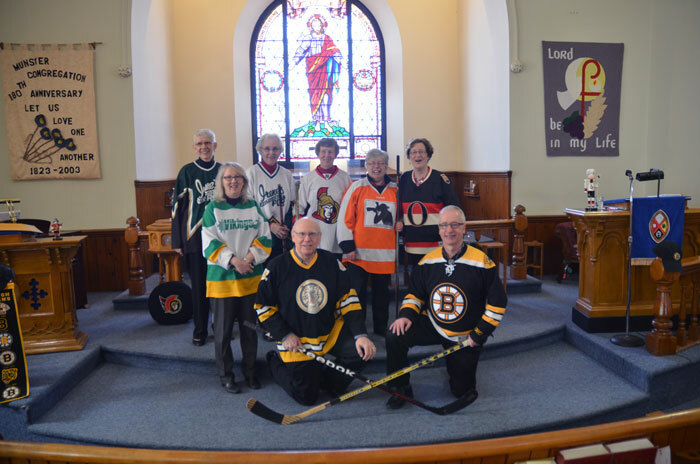 The congregation at Ashton United Church followed the service format and enjoyed a great time with their jerseys and decorating. They went further and brought a hockey net and set it inside at the back. No word on whether there was any actual use of it and whether anyone scored. Here are some photos of the morning in Munster United Church. Is he in the penalty box? He’s not near anyone else. 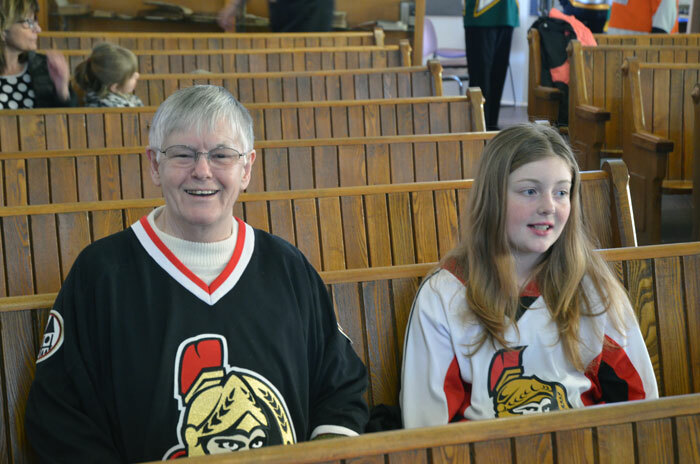 Two Ottawa Senators supporters. One favouring the home team and the other the away team jersey colours. Maybe this guy it hard of hearing. He was standing next to Rev Karen through the whole service. Or maybe he wanted to be right in on all the action. The All Stars Team (Choir and Rev. Karen) of the Old Timers League.